Although psychiatrists may be better trained to treat suicidal patients, most patients with suicidal ideation are receiving care outside of specialty psychiatric settings and can benefit from interventions in primary care. 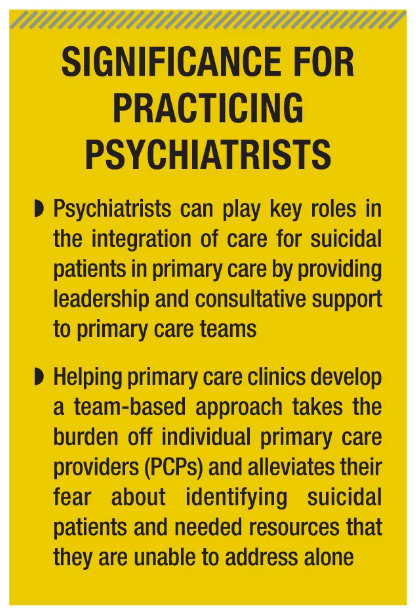 Many individuals see their primary care provider in the months leading up to suicide death.1 Therefore, primary care clinicians may have important opportunities to identify and treat suicidal patients. Recommendations about assessing suicidal risk in primary care settings are mixed, however. The Joint Commission now recommends asking patients about suicidal ideation routinely in ambulatory settings.2 The United States Preventive Services Task Force (USPSTF) does not make a recommendation for or against screening for suicide risk in a primary care setting due to insufficient evidence regarding the accuracy of screening tests and the effectiveness of suicide prevention interventions.3 The USPSTF does, however, recommend routine depression screening for adolescents and adults seen in the primary care setting when adequate systems are in place to ensure accurate diagnosis and appropriate follow-up.4 Depression-assessment instruments such as the nine-item Patient Health Questionnaire (PHQ-9) often include questions about suicidal ideation.5 Moreover, health care systems are increasingly implementing screening for depression as part of behavioral health integration (BHI) in primary care to provide patients with better access to needed care and address the well-known inefficiencies of siloing care for mental health in specialty settings.